How’s July treating you? Is it hot? Are you curled up with the air conditioner, lying in a hammock in the shade, or stretched out at the beach? I hope, whatever your July is bringing you, you’re enjoying the change of pace! 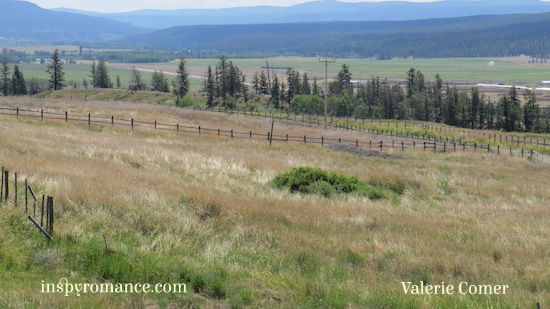 This week’s photos are also from our June trip west of Williams Lake, BC. The Chilcotin Plateau sits at about 5,000 feet above sea level and is the home of spindly trees, marshy lakes, and several zillion mosquitoes! The trees make the easiest and cheapest fencing available, and I thought you might enjoy seeing some of the styles. Just yesterday I heard about massive forest fires in this part of British Columbia that sprang up from a lightning storm Friday. Some homes have been lost, and many have been evacuated, including entire communities. Some highways and airports are closed. A long-established business where we bought ice cream just a few weeks ago no longer exists. Our friends are safe and, as far as I know, there has been no loss of life. Please pray for those affected by wildfires in BC and elsewhere. Alexa Verde’s winners are Jackie Smith and Debbie Holbrook! Autumn Macarthur’s winner is Julianne Archer! Hi Valerie. Bushfires are a regular part of an Australian summer, particularly here in Victoria, so I empathise with those affected in BC. A few years ago, I actually had the privilege of meeting a Canadian fire bombing pilot who had come to work the Australian summer. He had landed his helicopter next to the football oval, so at half time we wandered over to check out the helicopter and got chatting. I appreciate that sense of community- people travelling across the world to help others out. 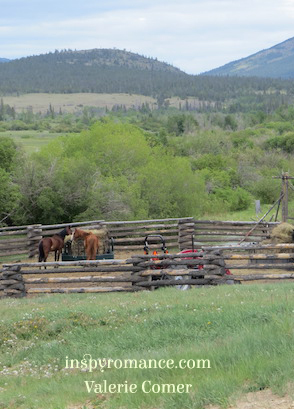 Great fence photos, I didn’t know there were so many types! We have years of plenty of moisture and years where the fires burn. Two years ago we had several local fires and, while our home/community was never in danger, the air was heavy with smoke for weeks and it was weird to look out the windows and see fire/smoke from two different fires west and south of our house. I am so sorry to hear about the fires! Keeping everyone involved in my prayers! 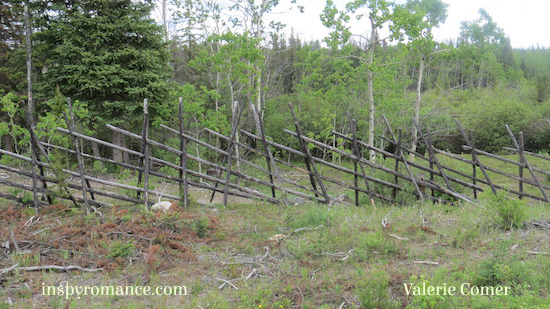 Thanks for your post and sharing those interesting fence pictures, Valerie. So sorry to hear about the massive forest fires. Twenty years ago our family lost our family home to a house fire. We lost everything. While it was tragic, we had a lot of family and community support. Knowing how devastating our individual loss was, I cannot imagine a whole community being destroyed. My heart goes out whenever I hear about disasters – flooding, fires, tornados, hurricanes, or earthquakes. Stay safe. Enjoy your Sunday. Thanks for hosting this month. Our house caught fire when I was a child – electric heater and a curtain in my sister’s room, I think – and I remember the terror and flames leaping out the window. They got it out while it was still small, but I’ve had a healthy fear of house fires since. I’m glad you had a good time on your vacation. Looks like a good week lined for Inspy next week!! Oh my, thank goodness for no loss of life! My aunt just posted on FB within the last couple of days where they were able to put out a massive fire in the Sparks Nevada area where she lives. I don’t know how many acres it was but it was pretty big from the picture she posted. Thankfully they were okay! Scary stuff for sure. Loving all the different fence patterns you’ve posted here. Never realized there was more than one way to build one, lol! 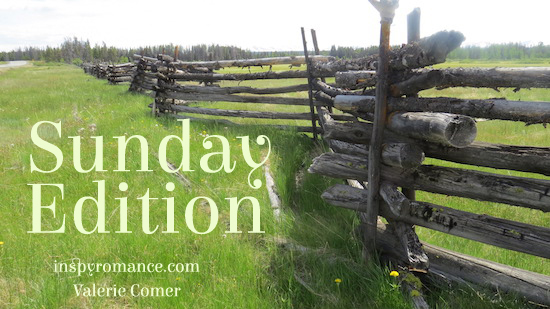 Looking forward to another great week on Inspy Romance. Congrats to the winners! I prefer coastal weather myself. I don’t mind the cold (honestly!) but I am not very fond of the heat, and we’re getting it in spades right now. Oh well. Just another month and it will start to cool off at night again! July has been going along pretty smoothly here for me in South Carolina . Of course you can’t avoid the heat. My husband and I are looking forward to a short vacation on Hilton Head Island at the end of the month! That sounds like a lovely getaway!